Please note that the content of this book primarily consists of articles available from Wikipedia or other free sources online. 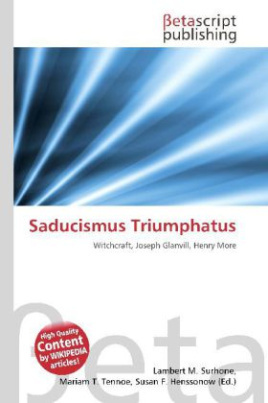 Saducismus triumphatus is a book on witchcraft by Joseph Glanvill, published posthumously in England in 1681. The editor is presumed to have been Henry More, who certainly contributed to the volume; and topical material on witchcraft in Sweden was supplied by Anthony Horneck to later editions. By 1683 this appeared as a lengthy appendix. Horneck''s contribution came from a Dutch pamphlet of 1670. The book affirmed the existence of witches with malign supernatural powers of magic, and attacked skepticism concerning their abilities. Glanvill likened these skeptics to the Sadducees, members of a Jewish sect from around the time of Jesus who were said to have denied the immortality of the soul. The book is also noted for the account of the Drummer of Tedworth, an early poltergeist story.